Many gem and mineral societies nationwide were established in the early- and mid-twentieth century in order to offer their members the opportunity to gain knowledge and skills in gem cutting, as well as identifying and evaluating lapidary materials, minerals and fossils. Most clubs now also organize field trips to collect specimens, cooperate with other local societies for special events, invite guest speakers at their monthly meetings, and hold annual exhibitions, auctions and shows. The more fortunate clubs are the ones that have a workshop open to the public and are able to offer formal classes on a variety of subjects related to the lapidary and jewelry arts. The ones that are truly privileged are the ones who have received the workshop space as a bequest from one of their members or by careful fundraising planning, while others balance a budget to rent such a space. Some of the clubs hold their meetings at their workshop facilities, while others have a separate venue. Another great asset of the gem and mineral societies is their monthly newsletter. On the helm of some of them are award-winning editors, such as The Gem Cutters News’ and Chipper’s Chatter’s editor Carolyn Weinberger, who has been doing that job with amazing dedication for over 35 years! Newsletters always include updates on events and classes, fieldtrips, information about the upcoming or past speakers and their presentations, and become a news update format for many club members, especially the ones that cannot always make it to the monthly meetings. They also frequently include valuable articles about lapidary, minerals, gemstones and jewelry — often written by fellow rockhounds and lapidaries that share their stories, or offer tips on how to clean minerals or cut certain gems — information that is not easily found in print. The level of expertise at most of these local clubs is amazing. While many members enter a club at the hobbyist level, there are a number of members in every club that are specialists in their fields, recognized in the trade and by their peers. Whether it’s mineral collecting and identifying large minerals or micromounts, cabbing, faceting or carving gemstones, creating hand-made jewelry by silversmithing or carving waxes and casting, or whether it is gem ID and gemology proficiency, there is a vast assembly of wisdom waiting to be tapped by fellow members. Sometimes new members are afraid to ask questions from the “pros.” But, in most cases, these “pros” offer their expertise willingly; all one has to do is ask them. The most successful clubs are those that welcome their new members and offer them help and new skills. Some clubs even have a “mentorship” program for a longstanding member to take a new member under their wings. Some clubs have “greeters” at their meetings, or “sunshine” appointed members to stay connected with the social happenings of their members. One more important mission that the local clubs fulfill is the development of friendships and camaraderie through the monthly meetings, workshop classes, fieldtrips, and annual picnics or holiday parties. Casual acquaintances may turn into lifelong friendships that may inspire creativity and new ideas, and may also help nurture future involvement with the club by serving on its board or the various committees. Often, new members are timid to volunteer, so a simple tap on the shoulder and a personal request to help with a task may initiate a lifelong club advocate. My husband, Andrew Herman, and I, met through the local clubs in Maryland, where we were both living at the time. I was president of the Gem, Lapidary & Mineral Society of Washington D.C. (GLMS-DC), and he was president of the Chesapeake Gem & Mineral Society, and we both used to go to each other’s club to speak. I can still vividly remember when he came to GLMS-DC, and after his “Phenomenal Gems” presentation he showed the group a large sapphire crystal. I asked him “what will you do with this crystal?” and he answered, jokingly, “one cab, two cabs, three cabs ...,” and because I thought his answer was sacrilegious to the crystal, he just simply gave it to me as a present!! This is just one story of many stories of friendships and camaraderie you will find at your local gem and mineral clubs. The Gem, Lapidary & Mineral Society of Washington, D.C. (of which both Andy and I are lifetime members), and the Gem Cutters Guild of Baltimore (which was Andy’s first club) are two of the founding members of the Eastern Federation of Mineralogical and Lapidary Societies (EFMLS), which was organized in 1950. In 1952, the EFMLS joined the American Federation of Mineralogical Societies (AFMS), the umbrella organization for the seven regional federations in the United States, which had been created only a few years earlier, in 1947. The Rocky Mountain Federation, to which Arizona belongs, was formed in 1941. This year, in 2017, the American Federation of Mineralogical Societies is celebrating 70 years. Many programs have been spearheaded and are sponsored by the AFMS and the regional federations. One of the excellent programs sponsored by EFMLS is the Wildacres Retreat Workshop, held high up in the mountains of North Carolina. Six days of learning and camaraderie, with minimal fees for housing, meals and classes, is truly unmatched anywhere in the country. I have been honored to participate twice as the Resident Speaker, who traditionally gives six different talks during that week. Clubs are often known for offering something special that the neighboring clubs do not. The Chesapeake Gem & Mineral Society near Baltimore (of which both Andy and I are lifetime members as well) is famous for hosting three auctions a year, where members bring their items to sell. They have coined the phrase “from basement to basement” which refers to rare items, often lapidary rocks and slabs that come out of oldtimers’ collections and are put out of sight again into another member’s basement workshop. They have developed a skill for running these auctions and a clientele eager to purchase the goods. When my husband and I moved to Arizona in 2005, we were a little overwhelmed with our intense involvements with the clubs back east and took a short break. Soon, though, we realized we needed to get back among people with similar interests and joined the two local clubs: the Tucson Gem & Mineral Society (TGMS) and the Old Pueblo Lapidary Club (OPLC). 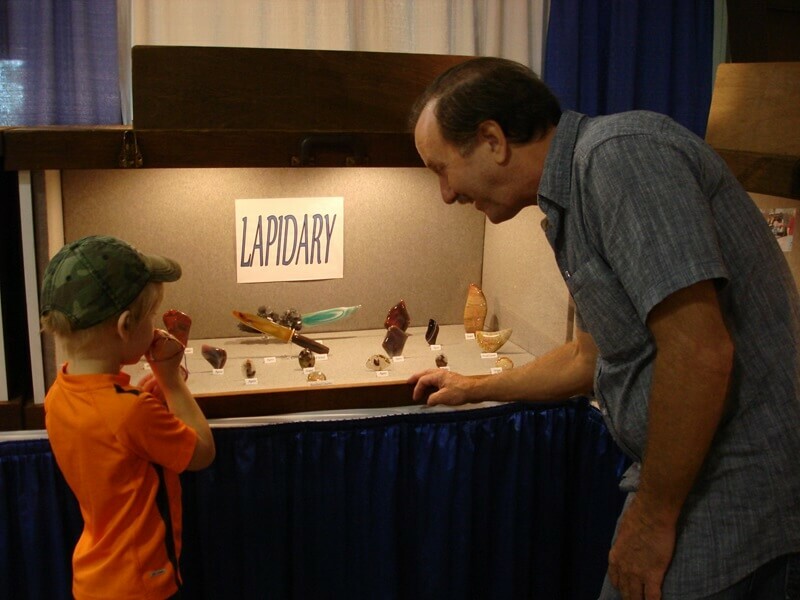 The first club is famous for hosting the big gem show, the Tucson, Gem & Mineral Show® every February, and it is more mineral oriented. The OPLC appeals to a wider audience of lapidaries, jewelry makers and rockhounds, and is blessed with owning both a meeting venue and a workshop facility. Many OPLC members volunteer their time and expertise to serve as monitors and teachers at the workshops, just to help members acquire new skills in cabbing, faceting, silversmithing, and wax carving. Their “Rock Saw Room” offers expert slabbing of large rocks for a nominal fee, a benefit that many of us members are thankful for. Both clubs are thriving. The OPLC membership is over 500 members, with approximately 100 members who attend each monthly meeting. These numbers are dreamlike and unfathomable for some of the aging clubs back east. Maybe one of the reasons is that a lot of oldtime members retire and move away to the “sunshine” states; Arizona, of course, being one of them reaping that benefit. As I serve as program chair for the OPLC, every month when I get up to introduce our speakers I look at the sea of attendees and a score of new members, I can only be grateful that we are doing something right. Great and diverse topic speakers are always a big draw and may help trigger new artistic ideas to the members. The distances in the West are much larger between the cities that have gem and mineral clubs, and people usually attend meetings in their own town. Maybe there are too many clubs along the eastern corridor too close to each other, often competing to attract the same patrons. Maybe the clubs in the West breathe the air of innovation, expansion, trail-blazing and the free-spirit of the American West frontier. Maybe there is a large number and variety of fieldtrips organized by the local clubs in the West, a huge member benefit that attracts a lot of rockhounds. Being under the umbrella of a gem and mineral club that has insurance for its members when they go collecting in the field is an enormous incentive for anyone to join a club. In addition, club fieldtrips can acquire special permissions to go into quarries, mines and collecting sites which are otherwise closed to the public. Whatever the reasons are for this flourishing era of the gem and mineral clubs in the West, we are certainly thankful, spread the word, and enjoy its benefits. Whenever we participate in a gem show hosted by a local club, we always encourage people to join the club and their activities and tap into these cradles of knowledge.